Correia Guitarra RightOn Lima Black. Cor: Black. 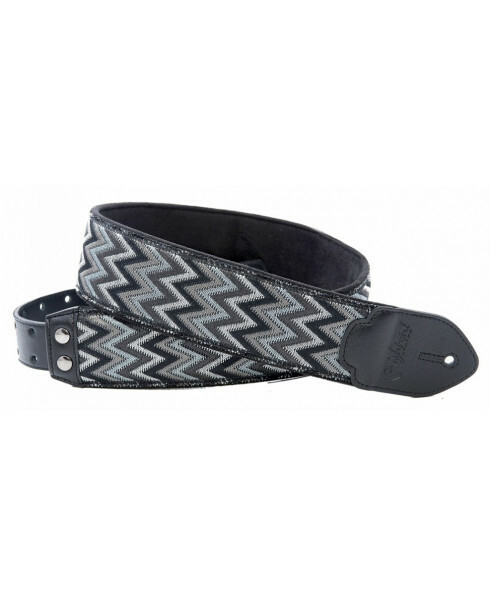 The strap Lima stands out for its nice print, 100% combinable with any guitar or bass. It is simple but very colorful. Not suitable for boring. The strap Lima stands out for its nice print, 100% combinable with any guitar or bass. It is simple but very colorful. Not suitable for boring. Do you remember a little to Peruvian typical patterns? Hence its name. This strap measures 6 cm wide. And has a long between 95 and 150cm with the unique adjustment system Righton Straps RAS (Righton Adjustment System) to adjust the strap to the desired length. The Lima has a surface of fabric and the end tabs are made of high quality leather. It also has a microfiber lining that does not slip and sweat-wicking. This strap is padded with latex 5mm which makes it very comfortable and is also very light. In the front end tab has two small pockets and has two "Fast pick dispender". you'll never lose straps no longer, better get them to your audience.